If you've been working on your Type 3 engine along with us, it is time to set the timing. Follow along as we walk you through how to replace a faulty distributor and set the timing correctly. This is a simple yet extremely important task to keep your Volkswagen running smoothly and safely. With the engine in out Type 3 reinstalled [by] reversing the steps of our tear down and removal videos, we're ready to start it up. We went to check the timing and discovered that one of the clips to the distributor cap had broken off. This was caused by a stripped mounting plate, inside the distributor and wasn't planned. Seeing as how we just had gotten in the brand new Kuhltek Vintage Cast Iron Distributors, this gave us a good opportunity to install one and set it up. To start the swap we rotated the engine over by hand, turning the fan belt until the rotor was pointing to the number one notch on the distributor. Then the distributor was removed by un-threading the mounting nut from the clamp on the engine case and then lifting it out from the engine. Then clamp is [loosened] and removed from the old distributor and installed onto the new distributor. After the clamp has been installed on the distributor, the O-ring seal is slid into place and lubed with a bit of oil. This will prevent damage to the seal during installation. Remove the cap from the distributor and slide it in place on the engine. Line up the clamp with the mounting stud on the engine case and rotate the distributor staff until it lines up with the drive gear. Then, push the distributor all the way down into place in the engine. Rotate the distributor body so that the notch lines up with the center line of the distributor rotor. The firing order, or the position the spark plug wires will attach to, is 1-4-3-2 in a clockwise position [starting] from the post directly above the notch on the distributor. The green wire from the condenser is plugged into the negative side of the coil. With the cap, rotor, and condenser all connected, we can now start the engine with the help of an assistant turning the key. The distributor is rotated by hand until the engine starts. We turn the distributor by hand slowly one way or the other until the engine idles smoothly. With the engine warmed up and idling on its own we can set the timing with the timing light. The timing light has a pickup which is clamped around the number one spark plug wire. The positive connector is connected to the generator positive post, and the negative connection is connected to the generator strap nut. On a Type 3 there is a timing hole in the fan shroud that we look through to see the timing marks on the pulley fan. The large mark at the left is Top Dead Center or TDC. The small marks to the right are different throughout the years but are typically marked at 7.5, 10 and 12.5 degrees. I use a timing light with a digital advance, so I can retard or advance the timing to check from top dead center and be certain of our timing marks. With the engine running, advancing the timing light until we see top dead center on the pulley we can see the initial timing is at seven degrees. The engine is revved up to 2500 rpm, we advance the timing light until the top dead center mark shows up again, and we see that we are at 24 degrees fully advanced. We want to see roughly 30 degrees, so we dial up the distributor to 30 degrees. [With] the engine still running at 2500 rpm we rotate the distributor until the top dead center mark lines up. I always set timing fully advanced. If we had only set it static at 7.5, we would have only been getting a total advance of 24 degrees and the engine would seem slightly sluggish at higher rpm. The engine is shut off and the distributor clamp nut is tightened. We start the engine one more time so we can check the idle speed on the timing light. The carburetor is adjusted to lower the rpm down to about 800-900 rpm. With that the Squareback is now road worth again so it can be taken home and we can get on to other projects. 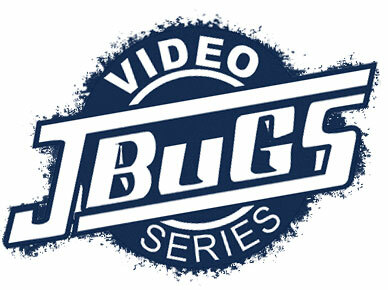 Thanks for watching and be sure to stop by JBugs.com for all your vintage Volkswagen parts and accessories.